You are here: Home / Carriers and Crates / Pet Carriers and Crates- Price, Difference, and Benefits! What are the Benefits of a Pet Crate? What are the Disadvantages of a Pet Crate? What are the Benefits of a Pet Carrier? Many a time, moving a dog through pet carriers and crates can prove to be a daunting task. Let’s be honest, no one (dog, cats or humans) enjoys being confined inside either one. However, these products are still required for any dog owner as it helps you put your dog somewhere safe during stressful situations. Owning a pet crate can also save you lots of time. Two of their benefits include easier toilet training and better security for your pet. Generally, they are used for both travel and security as airlines will stop you from flying unless your pet is contained. With the right equipment in the cage, you will be allowed to fly. This can be a pain in the a$$ if you don’t know what is required and if you miss anything such as dog water and food. Make sure it is dry food. Doing otherwise could mean you and your pet will stay back grounded. Because of this, a lot of people will go for pet carriers as compared to crates. Pet carriers, at times called dog kennels, can also be taken on board planes and the process is kinda easier. Majorly, because you can have the pet with you in the front. There is no need to place them in the cargo. Now, you are only allowed to bring them to places if you have a small animal breed. The last thing the airlines want is for a large Caucasian dog to be disturbing their passages. As stated in our example, you can see that there are various benefits and cons when it comes to crates and carrier. This is the reason why people either go for one or the other. But, which on is better when it comes to practicality? That is exactly what this article seeks to answer. If you’re interested to learn which side of the coin is the brighter one, we recommend you keep on reading. So, before we begin this face off, let’s first identify the meaning of dog kennels and crates. Although they do the same thing- secure and contain your pet, they are different. They can be used in varieties of situations and have their pros and cons, as you will discover little later. To be completely honest, you’re more likely to see pet carriers being used for transport reasons because they’re light and easy to carry (hence the name). However, we will still review them to get a comprehensive view. Pet crates are one of the best things to have (according to EcoPetLife.com) if you own pets. These things are simply large dog kennel looking objects your eye catches a glimpse of at breeding farm and they are very useful for a good number of reasons. When comparing them to dog carriers, it is often evident that they are larger and more useful for a number of reasons. These secured cells, can be made from a wide variety of materials, including metal and wood (materials you won’t see in carriers). Because of this, they are often used inside the home for permanent use as compare to traveling. They are mostly used for larger pet dogs. Pet crates also cost more than carriers and you will later see this in our advantages and disadvantages section of this blog post below. 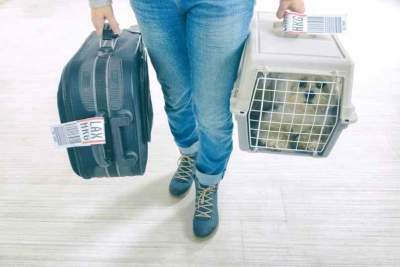 Most likely, dog kennels are the type of things yo’re most likely to see someone using this when boarding a plane, they are a look lighter when compared to crates and they are often commonly used with small dogs. They might be a little less practical when compared with crates but they excel when it comes to transport. They come in both soft and plastic sided but you won’t even see a carrier that is a slid wood or metal. This would increase their weight and make them too heavy. At home, they can be used as a small den for the pet. They can also be used like crates but are less practical because they’re more fragile and weaker. When not secured properly, larger dogs can break out of them if they’re not properly secured. Although this can be a problem, carriers are still used around the US and often substitute for pet crates when it comes to price. Cats are generally shuttled with carriers, sometimes allowing enough room for a cat litter box. So, pet carriers and crates… Which sounds better to you? Based on your status a a dog owner, you’re bound to know what these products are and what their functions really is, but we must do a short overview od each before looking at their benefits and bad sides. As earlier stated, pet carries are either soft-sided or hard-sided. Chances are you’ve come into contact with various real-life examples of both styles during your period as a dog owner. However, I’m going to explain briefly what each one looks like and explain the circumstances where one might be more appropriate than the other. Soft-sided carriers are products used for containment with mesh walls on four sides. These walls are meant to give your dog better ventilation and a bit more scenery to look at as you carry him/her/them. In other words, it will feel like you’re carrying around a royal subject rather than a dog. But what they provide in comfortability and open view is negative to the overall safety of the animal inside. See, these mesh walls are easily escapable for curious and mischievous dogs. A zipper opens these soft-sided crates, and zippers are known to either slip own or malfunction; allowing for an opening to present itself. Also, it makes it easier to control our dog when you’re opening up the carrier. Knowing this, if you own a loki-like terrier like my sister, don’t get a soft-sided carrier. This will only result in you chasing them around the city streets, worse, the airport. On the other hand, if you own an older smaller dog that you like to pamper, go ahead and get a soft-sided carrier. In my opinion, every older dog deserves to receive a royal subject treatment every now and then. These generally look a little harsher, they’ve proven to be safer and secure for your smaller dog. I mean, wouldn’t you trust a well secured gated lock arrangement r=better than a….. zipper? I know, you would. But this sense of security comes at the expense of some other things sucg as scenery and ventilation. See, these hard-sided dog carriers have solid slides with nowhere to look from aside the gate in the front; some do have ventilation holes on the sides. As a result of this, some pet owners view these carriers as little prison cells. However, I’d boldly say that these carriers have a better primary function than making your dog feel comfortable; they make sure they’re safe and have little to no chance of escaping outside of human error. 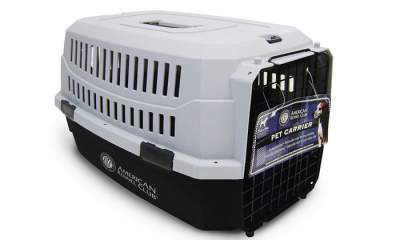 And just like crates, these pet carriers are airline approved and make your dog feel safe. So, if you have a smaller dog with a high chance of making trouble, get a hard sided carrier, and your problem will disappear. Like pet carriers, there exist different types of crates you can get your dog as well. Most likely, any crate you’re considering will generally fall into any of the two categories: wired crate or plastic crate. A wired crate is metal wired dog cage that is rectangular in shape. It’s really what you’d imagine a wired dog crate to be like; they quickly do their job and keep your dog as comfortable and secure as possible. Otherwise, these metal crates are usually very convenient for the dog owner; as they are easily fold them for storage purpose, and they come with divider plates that allows you to adjust the crate as your dog gets older and bigger. Pretty awesome, right? It’s also primary to note these crates have unbelievable air flow that works a lot better for bigger, long-haired dogs. This feature also allows them to see everything around them, which will help keep them calm n safe. But with this perk comes a kind of annoying con: they can see you, so, they will whine or bark at you to get them out. 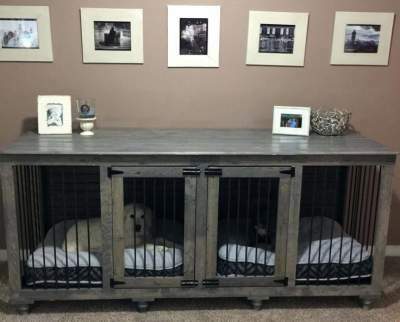 Because of this, if you have a dog with separation anxiety, I won’t use this type of crate for transportation, but rather a safe place you can put them when you’re away. When compared to wired crates, plastic pet crates are more portable and far more lighter. And they’re made from, guess what? Plastic materials!, which makes them kind of durable. There also is a lot of less breathable than wired crates. See, these animal crates have four solid walls, which limits the ventilation. Evidently, the pet companies try to make up for this by putting little holes on each side. But there’s still a lot less airflow than what a wired crate would offer you. BUT, there’s an added advantage with this lack of access to the outside world; your dog’s a lot less likely to bark or whine at you. And it clears away other possible distractions as well, so, you’re less likely to cause a scene when transporting your dog in one of these crates. Lastly, these plastic crates are generally completely airline approved, which makes them really convenient for smaller dog owners. I mean, with these market place crates, you can easily bring your dog abroad the plane as a carry-on. But it’s also important that you don’t give them too big of space. Just enough space to stand up, turn around, and lie down comfortably should work great. The reason for this is if you plan on using the crate for potty training, a crate/carrier that’s too big will retrogress the progress. Know this, dogs won’t poop or pee where they sleep, but with a bigger crate/carrier, they could just relieve themselves on one end and sleep on the other. So, with this in mind, ensure the carrier/crate you pick has only enough room for your dog to turn around, stand up, and lie down comfortably. Now, that you are comfortable with all the types of carriers/crates and how to find the right size, for your favorite pets, it’s time we begin showing you more pros and cons of each that will help you find the best one for your pup! Pet carriers and crates are both great for flight! But first, here’s a little criteria guide to help you figure out which to go for. It’ll help you figure out exactly what we consider to be important and then you can employ the same rating system in your research. Let’s begin the comparison with pet crates. There is a whole range of benefits to having a pet crate and getting one will be determined by a range of factors, including uses, your budget, and breed. Dog crates might be more practical but they come with heavier maintenance and price tag, but many wire crates come with a divider panel, which allows the dog to grow into the crate. Below, you will discover a range of benefits that pet crates provide. As you will see, there look to offer more when compared to carriers. One of the quick pros of having a pet crate is the fact they are incredibly secure. They are a lot of crates that are made from tough aluminium. One brand, in particular, known as Zinger, offers some of the best metal crates in the business and they are used for so with bigger and more aggressive dogs. In addition, some crates are so secure they can withstand car crashes. MIM is one of the only brands that crash test crates. They have crumple zones and hatches that stop your best friend from getting killed. Zinger crates have reinforced locks that will stop the escape artist in your dog; prevent it from lifting it up with their nose after knowing how the latch works. Pet crates secure your dog and are very great at preventing them from escaping. Yes, carriers can also be used for air travel but crates require a lot more preparation. Even at that, pet crates are commonly used in air travel and are very efficient. To avoid embarrassment or creating a scene, you will need to read the airlines guidelines, but in almost 100% of the time, they all follow the standard IATA rules. Majorly, when following these, you will need to have some pet gear with the crates, including containers for water and dog food, as well as a live animal sticker. Some crates are primarily designed for air travel and others are not. Petmate Sky Kennel and Sherpa travel carrier are two of our most recommended air travel crates on the market with countless product ratings. These travel carriers vary in that they are designed for in-cabin use, and for smaller animals. When compared to a carrier, wire dog crates are simpler to clean, especially if they’re plastic or metal. A lot of them also come with replacement pans, giving you the chance to quickly slide up against any muck and debris and wipe it away. This explains why crates are popularly used by owners who love long, muddy walks. The last thing you want is for your beautiful new car seats to be covered in mud. A pet crate can be used to absorb the dirt and contain it one easily cleanable area. One of the best benefits of pet crates is their ability to speed up the toilet training in pups. It is true with no doubt that puppies love to mess in your new home and the reason behind this is because they haven’t yet associated the garden with the potty house. A pet crate will help you out easily with less effort on this. Because the crate is reasonably associated with a den, the pup will refuse to mess inside it (based on wolf instinct). You can use this to force them to hold it in and then when the time is right, quickly grab them and place them outside to carry on their business. When they go to the toilet, praise them with love and cuddles. Repeat this process over and over again until they learn where they need to go naturally. One of the things that a carrier won’t do is grow with a puppy. As many of you already know, puppies grow very fast and if you have a large breed, it won’t take long for them to outgrow their old crate and bed. As a result, a lot of manufacturers have crate dividers that gives you room to slowly expand the crate as the puppy grows. This allows you to purchase one crate and one crate only, saving you lots of cadh. These dividers are often seen with wired crates more so than plastcic or metal. Of course, like there are many benefits, there also exist limitations to pet crates. This next section will walk you through some limitations of pet crates based on our experience and why some people may not want to buy/use the products. They are good to have but as you will quickly discover in the section below, they can be very expensive-pet carriers and crates! There is no doubt over the truth; pet crates are damn expensive. Depending on the material and brand you aim for, you could be paying as high as $600 or more. However, as I just said, it all depend on the material and brand. In general, wooden and metal crates are considerable more than wire and plastic. It is because of this we recommend that you view pet crates as an investment opposed to a one-time purchase. The one big advantage you will see with pet kennels is they are easily transportable. With some pet crates, you will need special carts and wheels in order to move them around. This is more right when you consider metal crates like Zinger. They allow you to purchase a set of wheels when it comes to transport and this will simplify things a whole lot. However, this means that you’ll have to spend more money. Moving onto dog carriers, we will now take a look at some of the advantages associated with them. They are a little different from crates and one thing you will notice is that they’re a lot cheaper. Generally, these are the type of things you want if you don’t want to crate your pet permanently or if you don’t want to invest heavily. They have their uses and for this reason, they are used across the globe. Remember what I said earlier? You’ll save more money if you buy a carrier instead of a crate. Most of the carriers in the market are below the $200 price mark and are like the perfect fit if you’re not very committed to crating your pet. Again, the price will be determined by the size and the brand of the carrier but, in general, they will be considerably less. The biggest share in the market are soft-sided pet carriers but there are still a small number made from plastic. You can assume they’d be light to carry as they are made form light materials. It is for this reason that older people with small dog breeds love carriers as they make travelling more convenient and with minimal efforts. As stated in the paragraph above, the carriers are often used with a small pet. The major and most evident reason for this is because larger dogs are harder to lift and if you plan on transporting a large/medium sized breed, we always recommend that you use a crate. Small dogs will be easier to carry, and, more importantly, they will get accepted for in-cabin use. Interestingly, carriers are the only pet transport that is allowed for in-cabin use. The other devices have to be stored away in the cargo. This is to a huge advantage of owners with anxious pets as they will be able to comfort them directly during the trip. It is also a lot less scary for a pet traveling through a plane when they’re in the cabin and will result in less “accident” during the journey. What are the Disadvantages of a Pet Carrier? Like pet crates, carriers have their bad sides too. The things you have to understand is that where pet crates rules/have an edge, carriers won’t and vice versa. For that reason, I have decided to leave the cons a little simple and not deep. Pet crates are practically more useful. The single point I do want to clarify is their security- pet carriers and crates! One of the largest problems with carriers is their security. As they are often soft-sided, they can be broken out of and will not contain larger dogs. If they want out, they’d burst out. All it takes is an aggressive outburst and free they will get. So, with bearing that in mind, it is safe to say that these would not be great for larger dogs. Pet carriers and crates are two different things and terms yet animal lovers tend to mix them up. They both have their good sides and bad sides but you should always be open to your options. Generally, pet crates are essentially more useful and have more practical advantages but comes with a hefty price tag on their head. Carriers, on the other hand, are way cheaper and easy to perform transportation with but are less secure, not great for larger breeds of dogs and they are not as effective when it comes to potty training a dog. So, head over to a store and take a quick look around, check out some of the available options while considering your budget. With this pet carriers and crates guide, you should be able to see what is best for you and your fur-friend.